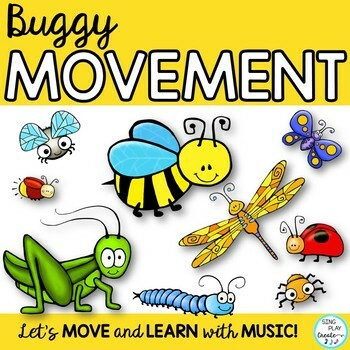 BUGGY MOVEMENT ACTIVITIES are perfect to get your “littles” moving in music classes or in your preschool activities. Students will love imitating the different bugs while developing gross and fine motor skills. 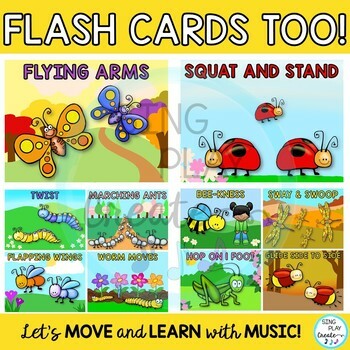 Elementary teachers will love using these bug movement cards for brain breaks too. Best for Preschool through 2nd grade ages. FREEZE- Stop the music and students freeze in place. 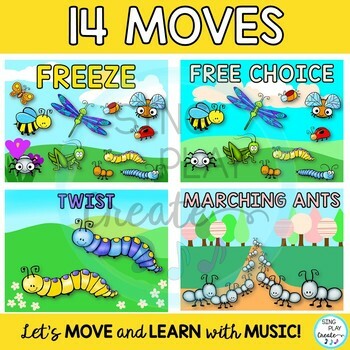 FREE CHOICE- Students can choose their own moves. Twist- Students twist up and down. Flapping Wings- Have students “fly” around the room. Worm Moves- Students can lie on the floor and slide like a worm. Bee Knees- Students pat knees on the beat. Sway and Swoop- Students sway side to side while dipping down. Encourage large arm movements. Hop on 1 Foot- Students hop on 1 foot. Remind them to switch feet. Glide Side to Side- Students can glide (side step) around the circle or in their spaces. Wiggle- Encourage students to wiggle arms, hands, fingers, toes, head and the entire body. Spin Around- Encourage students to spin in their space. Remind them to switch directions. Sit and Stand- Encourage students to crouch down and then stand up like a squat. 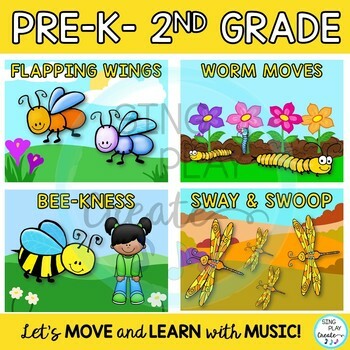 Music and movement activities- choose music to help students move high/low, fast/slow, short and long moves.